I have an admission to make: just lately I have been drinking more coffee than tea. This came about for a variety of reasons, the most important of which was our summer trip to the midwest of the United States. I have always drunk coffee (albeit decaf for some years due to boring health reasons) but have generally favoured an espresso with various milk options: a latte; a cappuccino; a Milchkaffee; whatever the local variety happens to be. I drink one of these most mornings but at other times of the day it just feels like too much milk. Then, in the States, I rediscovered filter coffee, taken with that most fantastic of American inventions, Half and Half. Oh filter coffee, why had I forsaken you for so long? Probably because in my mind it is associated with that cooked-on-the-hotplate-for-too-long muck you get in most offices. But the cooking, I discovered, is not necessary. And that's where the Chemex came in. I had seen these beautiful coffee makers before and admired their simple design aesthetic but I had never tried a coffee made in one. I have to say that when I did it was a revelation. Rich, complex but clean with none of that sludge or burnt taste that the filter coffee of my memories had. Of course the quality of the beans is crucial but I really like the way that the Chemex delivers the coffee. Since then my beverage-life has been a whirlwind of grinders, filter papers, different coffee suppliers and beans. After starting small ("we can just buy the coffee ready-ground, that'll keep the costs down") we soon purchased a Baratza Encore grinder. The truth is that the quality of fresh-ground coffee is pretty difficult to argue with. After much research I went for the Encore as it seemed to be the most rated grinder that didn't cost silly-money (although it was still £120). We're also now making our own Half and Half which works out to be more-or-less half single cream, half semi-skimmed milk (or use the Rahmsahne you can buy in German supermarkets which has about the same fat content). But what of the most important thing? The coffee itself. There is, as you might imagine, some fantastic coffee out there. I'd always been a fan of Monmouth's espresso-based coffees so it was no surprise that they also have some great beans suitable for filter. But my real discovery has been Has Bean Coffee. A small, independently-run mail-order company based in Staffordshire. They stock a fantastic selection of coffees, mainly purchased directly from small independent producers. And the great news is that they also have some truly delicious decafs. All of their coffee is very reasonably priced and is delivered in a day or two. I think the biggest revelation about my new coffee-obsession though, has been the difference between the online tea and coffee world. 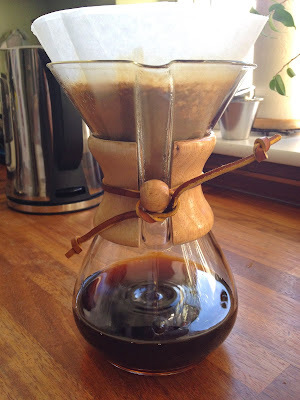 Being an avid blog-reader I inevitably turned to blogs to learn about brewing methods and to read coffee reviews. For all of you out there who have come to this blog as part of the tea-world I've got to tell you that we inhabit a rather lovely, supportive and friendly place. The coffee blogosphere is aggressive, macho and critical. If you fancy a smile go to pretty much any coffee review and look at the comments: these people are not messing around. There are accusations, name calling, and unhealthy doses of one-upmanship. Seriously, I was amazed. And that got me to thinking. Where the tea-world is communal and contemplative and somehow soft, the coffee-world is individualistic, competitive and bursting with machismo. Maybe it's a reflection of the drinks themselves - coffee's adrenaline rush that hits with the caffeine - or maybe it's about how it's enjoyed. Coffee often seems to be a tool to keep going, work harder, move faster whereas tea (certainly for me) is about taking a few minutes out of your day to relax. Whatever, it's certainly been quite an eye-opener. I have really enjoyed my foray into coffee and although I don't claim to be any kind of expert (she says quickly before twenty coffee fans abuse me for expressing an opinion) I will talk about particularly great coffees I've enjoyed from time to time: after all I know that for some of my readers Kaffee und Kuchen is more normal than afternoon tea. When all is said and done though I am definitely a tea-drinker at heart and I'm very happy to be part of such a warm and supportive online community. Who knows, maybe we can inject a bit of that kindness into conversations about coffee. Thank you. The trip was pretty wonderful in every respect! Come over and have kaffee ind kuchen with me soon!